How many US Automatic Sentry 300 S reviews have you read? Are you even more confused because one buyer’s review is the opposite of another? To help you decrease that confusion, we have read many reviews found on blogs and even on websites that sell gate openers and then compiled the information and used it to make a more concise review. Is the USAutomatic Sentry 300 S a worthy residential gate opener? The US Automatic Sentry 300 S is available as a single or dual leaf gate opener that can be powered through an AC adapter or an optional solar kit. It can be used for gates that are up to 20’ in length and it can open or close the gate in as few as 16 seconds. It is manufactured by US Automatic, which has been in this business since 1994 and has a great reputation for producing high-quality products in the US. They were also one of the first companies to consider making use of solar power for their gate openers. The US Automatic Sentry 300 S gate opener, which is available as a single or a dual leaf gate opener, is a worthy purchase. It is well built with a sealed circuit board that makes it well protected from moisture or insects, which makes it last longer than other gate openers. Who would benefit from this gate opener? Are you fed up with draining and drying your gate opener just to make it work? Do you hate it when you have to clean up your gate opener because spiders decided to make it their home, which results in your gate opener acting up? The US Automatic Sentry 300 S has the circuit board enclosed in a plastic casing to make sure water and insects don’t damage it. This is great for those who just want to install their gate opener systems then forget about them. Do you want to qualify for a 30% federal tax credit? When you choose to connect your US Automatic Sentry 300 S to a solar panel, you can apply for this tax credit. This gate opener runs on a 12V battery that can be charged either by the included AC transformer or a solar panel kit. Take note that the battery and the solar kit are optional and sold separately. Are you getting impatient with how slow your gate openers open and close the gate? This gate opener is able to fully open or close the gate in as few as 16 seconds no matter what the gate is made of. If you want to customize your gate opener even more and add more functionality, you can purchase other accessories that you can integrate with your gate opener system. You can purchase electric gate locks, a solar kit, the exit sensor, a wireless keypad, a photo eye kit and additional remote controls. Another great thing about this gate opener is that it has a safety feature, which stops and reverses the movement of the gate when it hits something. This helps prevent any crushing accident to your car, people and your pets as well. Of all the gate openers on the market today, two brands always dominate the top positions in the driveway gate opener reviews and these are US Automatic and the Mighty Mule.Both of these companies are known for producing different models of gate openers for different types of gates. They are also known for providing solar kits that can be connected to the gate opener systems. Although the Mighty Mule offers more affordable options, US Automatic offers a better design of the circuit board by enclosing it in a plastic material. This added protection helps prevent the gate opener from easily being damaged. Both brands produce great contenders and both are even mentioned in some LiftMaster gate opener reviews for comparison. These brands have their own loyal customers and if one doesn’t work for you, the others are worth a try. 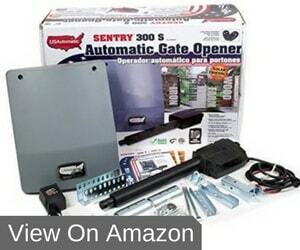 The US Automatic Sentry 300 S is more expensive than other single gate openers. There is also another Sentry 300 S gate opener that is meant for dual swing gates.It comes with the gate opener arm, the control board, mounting hardware, a watertight junction box, 2 remote transmitters, 50’ cable and the manual. It is packed in 29.1” x 9.6” x 24.1” and weighs 34 lbs. If purchased on Amazon, it comes with a 3-year limited warranty and can be shipped in as few as two days. This gate opener is specifically made for gates that have a length of up to 20’ and a weight of up to 800 lbs. It can be installed by simply using the brackets included but it can also be welded to make it more secure. The battery is required for it to function but is not included in the purchase. It charges with the AC adaptor that is included in the purchase. Although it also supports a solar power option, the solar kit is not included but it can be purchased separately. Other accessories such as the wireless keypad, gate locks, and photo-eye kit can also be purchased in addition to this unit. The remote controls and wireless keypad run on CR123 batteries. They are not that common and not all readily available so you should keep some as a backup just in case yours run out. With this US Automatic Sentry 300 S review, we have presented the different positive and negative things that you can expect from this product. Considering all this information, we can recommend this product because it is well made. The circuit board is well protected, it is durable and it can even run on solar power. Although it is more expensive than other swing gate openers, many would rather pay more and experience less hassle and headache than save on something that doesn’t last long.